One thing you can count on from people who have had work done in their home is they talk about it. People with foundation problems have a lot to say as they go through the process; they're going to feel relieved if it goes well and very stressed if things do not go the way they hope. What does this mean for you? Lots of research is available when choosing a foundation repair contractor. Always use foundation repair contractors that are prescreened, licensed & insured. That provide Free Inspections & Estimates. Check out the testimonials for your foundation contractor. A contractor who is proud of his work and good at it is going to have enthusiastic customers. Ask the foundation repair contractor you're considering to provide you with testimonials and references that you can use to see if they're the type of people you want to work with. Have some questions about the contractor ready before you call. Look up your foundation contractor with the Better Business Bureau. The Better Business Bureau is there to protect the consumer - both before and after the purchase is made. Check with the BBB and other local corporations to see if the company has any complaints registered and how the foundation contractor resolved any complaints they may have received. Research your foundation expert online. When people aren't happy, they sometimes go online with their complaints. Research the foundation contractor with a search engine to see if they have any major complaints built up against them. Also- be sure to research the repair method they'd be using to see if the experts believe in it. Remember to take into consideration the volume of work your contractor does. If they have two thousand customers per year, they're sure to have a complaint or two out there no matter how good they are. There are some large warning signs you can easily look for when choosing a foundation repair contractor. Be sure to also find out how long they've been in business- fly by night contractors sometimes don't stay open long enough to get the bad reputation they deserve. Make sure that you are not asked to pay too much up front. Most reputable contractors will ask for about 30% before the job is completed and the rest later. If they're asking for the full amount beforehand- especially if they want to be paid in cash- be extremely careful. Read all financing information carefully. There have been many scams in the market where the contractor will sign you up for "financing" that is really a home equity loan. These loans tend to have very high fees and interest rates. Sometimes, the contractor is even paid by the loan company for their effort. They're not the kind of contractors that will be interested in doing the best they can for your foundation repair. Extremely long warranties on a product are usually too good to be true. Ask for proof that your contractor has workman's compensation insurance for all subcontractors as well as themselves. If they don't, any injured while on your property can become your financial responsibility. This can lead lawsuits and demands that you cover the expenses and hospital bills if they're injured. If your state requires them to be licensed or certified, be sure to ask for that as well. Get a free estimate before committing. Don't settle for less than a free estimate from a qualified local foundation repair specialist. This is a complicated job, and you're going to need someone with direct experience in the field to trust your home to. The best foundation repair specialists will be confident enough in their reputation and professional presentation to offer you a free, no-obligation estimate, so be sure to take advantage of it. Have them over, ask many questions, do some research, and find out if they're the right foundation contractor for you. FoundationRepairExperts.com would like to help you get started on your journey by connecting you with a pre-screened foundation repair contractor in your local area. We've scouted out the best local contractors in all 50 states, and we'd like to connect you with the best. 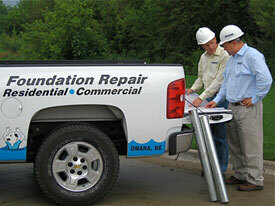 If you'd like a free foundation repair estimate from a local contractor, call or e-mail us today! If you're interested in having an independent contractor visit you and have you with your Foundation Repair project, be make sure you are picking the best on the market. No two general contractors are the same- research each before you select one to help you with your Foundation Repair. When we screen our Foundation contractors & dealers, we check their reputation with the Better Business Bureau, check references, make sure they offer written Foundation Repair warranties, and run them through our tough screening process. At wet-Foundation-repair.com, we know that the conditions in the Foundation are different than anywhere else in the home and need special products for your sub floor, your Foundation carpet, and your Foundation walls. We'd like to set you up with one of our presecreened Foundation Repair contractors who can offer you a free home improvement estimate and free price quote proposal that will help you with your Foundation Repair plan!